While camera equipment itself does not take pictures — photographers do that — I am frequently asked as to what equipment I use. Here is a listing of my currently used gear. Don’t go out and duplicate this list; buy the equipment you need to take the photographs you like. I tailor the equipment I actually carry depending on the job at hand. I use Think Tank Photo and Mindshift backpacks to carry equipment in the field. 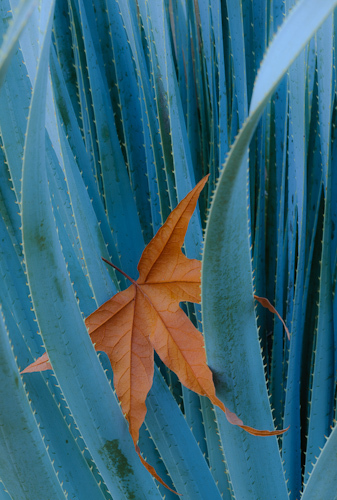 An Arizona sycamore leaf caught in sotol. My standard tripod is a Really Right Stuff Versa 24L carbon fiber model with a Really Right Stuff BH-55 ball head complete with an Arca-style quick release (all cameras and lenses have Really Right Stuff quick-release plates mounted on them). I use a RRS leveling base between the ball head and my tripod to facilitate my panoramic work. For the latest Nikon information visit www.nikon.com. Think Tank Photo is at www.thinktankphoto.com. Click HERE for a special deal. See www.reallyrightstuff.com for tripods, the BH-55 ball head, L-brackets, and custom lens plates.